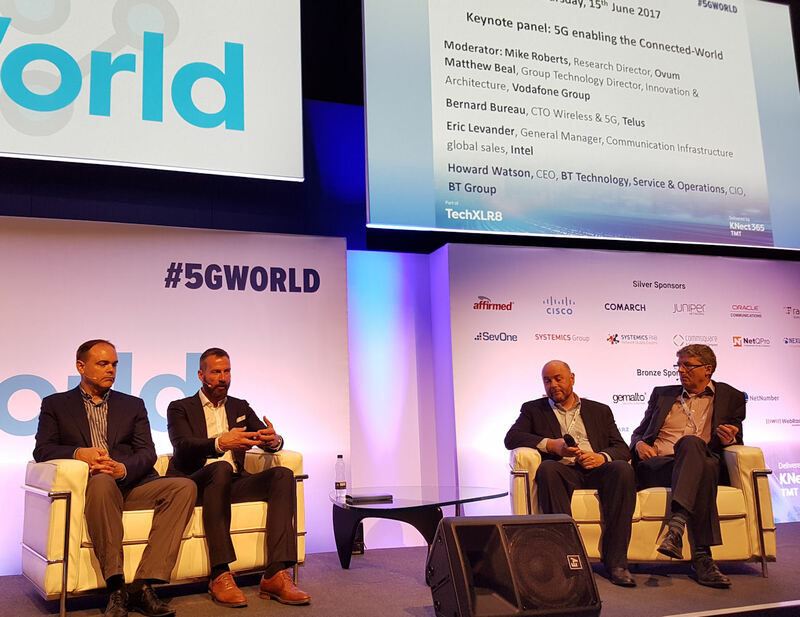 Keynote speakers on the second day of 5G World 2017 agree that the nature of 5G will be determined by demand such as never before. Previous mobile technology generations have largely gone with a ‘build it and they will come’ philosophy. This probably hit its peak with the coincidence of the dotcom speculative bubble and the 3G spectrum auctions, which saw operators almost bankrupt themselves in their haste to jump on those bandwagons, but saw little return on that investment for years as the anticipated stampede to various mobile data services failed to materialise. Howard Watson, BT Group CIO, revealed that BT’s strategic thinking is driven by anticipating what end-users will want to do with devices such as smartphones in future. Future end-user demand can be loosely grouped into five categories: enhanced mobile broadband (eMBB), massive IoT, mission-critical, service consistency and rapid service. The first of these is likely to be eMBB, according to Mike Roberts of analysts Ovum. He forecasts eMBB to launch in 2019 but didn’t detail what the cut-off point will be between continued LTE advancements and eMBB. Ovum also forecasts that the US will be the front-runner when it comes to 5G adoption, it will have been launched by 120 operators in 45 countries by the end of 2021 and we will see 389 million 5G subscriptions by the end of 2022. Watson concluded by calling on the industry to do a better job of thinking about 5G from an end-user perspective. “We need our vendor partners to think end-to-end about what 5G can bring to end-users. Also can chipset vendors please not chase short-term, country-specific, spectrum-based solutions,” he pleaded, echoing a growing consensus among operators that vendors need to raise their game. We then heard from Hossein Moiin, CTO of Nokia (pictured above), who concurred that the power of 5G lies in the hands of end-users and that this is much more the case than in previous generations. While stressing that “the only limiting factor is our imagination,” Moiin conceded that some of the currently discussed utopian use-cases, such as remote surgery, are still a long way from becoming reality. Some of the more immediate opportunities presented by 5G will include remote healthcare, a greater degree of network flexibility, some vehicle automation, such as drones, and improved capacity and coverage thanks to things like fixed wireless access. On the latter, Moiin stressed “its time has come,” implying it’s not necessarily just a 5G use-case. In a subsequent discussion panel (pictured below) BT’s Watson was less optimistic about FWA. Directly referring to Verizon, which is the major operator currently most bullish about it Watson said he has yet to be convinced of the economics of it. Bernard Bureau, Wireless CTO of Telus, agreed that FWA is just one possible tool to solve certain connectivity problems and noted that if you base it on just macro sites you will soon encounter capacity problems, but if you also make use of utility poles you will have to buy a hell of a lot of small cells. The panel all agreed that a lot of the opportunities being anticipated with the arrival of 5G are already possible thanks to the continuing evolution of 4G. “The disruption is probably more on the business side than the technology side,” said Eric Levander, GM of comms infrastructure global sales at Intel. In response to a question from Telecoms.com the panel anticipated the initial commercial opportunities will depend on the increased speed and capacity offered by eMBB. While we’ve been looking forward to 5G arriving in 2020 for some time, as ever this will be a gradual evolution with some commercial opportunities associated with it already available and many not likely to appear for several years after. It does seem to be clear that investment and progress in 5G will depend more than ever on demand, as opposed to supply.